The Lower Platte River and its accompanying wetlands provide important habitat and nesting sites for a variety of waterfowl. 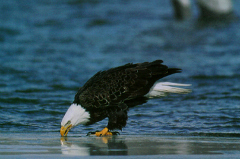 In recent years, an average of 46 bald eagles have wintered here. In addition, endangered peregrine falcons are attracted to the area during migration due to its large amount of shorebird and waterfowl prey. Remnants of oak woodlands and oak-hickory forests blanket the river’s bluffs and provide year-round and migratory homes for a variety of birds. Cottonwoods in the floodplain provide habitat for a broad range of birds as well as mammals, reptiles, and insects. Freshwater marsh areas provide habitat for beaver, mink, waterfowl, wading birds, and many other species. The river’s significant spring flows, ice, and sediment are the basis for sandbar formation – a critical habitat for the endangered least tern and the threatened piping plover.